Led by Colombian writer and artist, Juan Manuel Echavarria, this project saw ex-combatants participate in art workshops that culminated a collaborative exhibition of their paintings entitled “The War We Have Not Seen” at Bogota’s Museum of Modern Art in 2009[i]. The ex-combatants were former soldiers from paramilitary and guerrilla organisations and the National Army representing the different factions of Colombia’s war. The art workshops ran over 2 years. 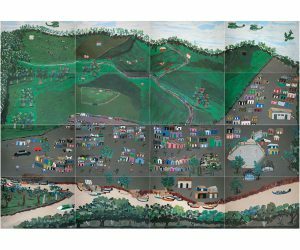 They painted about their personal experiences and their art illustrated the violence, forced displacement, drug trafficking and plundering of the land that has taken place over the years of Colombia’s war. Much of the project process is described in various essays on the project website[ii] Echavarria worked in partnership with NGOs and government run projects to find workshop participants. There were separate workshops for each different group of former combatants with all their paintings coming together in the final exhibition. Echavarria, with 2 other artists, ran workshops in hostels in Bogota for former paramilitary combatants from all over the country demobilised under the 2005 Justice and Peace Law. He then went on to meet former guerrilla members who were participating in a City program for ex-combatants who deserted from guerrilla groups. Finally he found demobilised soldiers from the Colombian Army by running workshops through the army hospital in Bogota with wounded soldiers. He wanted to involve female combatants from all sides but was only to make contact with guerrilla female ex-combatants. The focus was on file and rank soldiers in order to explore how the war was understood and experienced by those that fought and to generate stories that might counter the narratives of war ideologists. 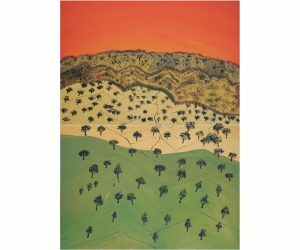 Echavarria is an established artist and has produced his own artistic work on the Colombian conflict[iii]. He was able to use his own cultural capital to secure funding and institutional support for the project which was financed through grants and corporate sponsorship. The exhibition was first shown in Bogota but went on to other Colombian cities and to the States and Europe. The workshops were voluntary and by the end of 2 years there were 420 paintings by 120 artists. 90 of these were selected to make up the final exhibition. Painting was not taught, materials were supplied. The proposed method was that they painted on 50x30cm wooden boards. The former soldiers were asked to paint about their memories and experiences but were free to paint how and what they wanted. Echavarria explains how there was a process in place to establish trust between the participants which involved a lot of talking and listening and it was only with this that many of the stories surfaced. Everyone received as many boards as they wanted so they could put their stories together as if they were working with the pieces of a puzzle. The professional artists spoke with the participants about how important it was for the country to see the truth from within, to try to understand how these events were happening and why they continue to happen. Workshop participants were keen to have their paintings seen publically. The project did have a significant therapeutic value for the participants but this was not the main objective. Rather the project sought to build historical memory and understanding through art, supporting ex-combatants to process what cannot be made sense of through words.